So I didn't get the deals posted from last night OR the Brownies made either. Am working on that this afternoon…I hope?! I did manage to get all of the nametags finished for camp this weekend. I mean, completely! So that's a banner day for me. but I I decided that 8 die-cut pieces x 50 wasn't exactly how I wanted to spend the next few days…So I tweeked a few things and ended up with this. Yeah, I know..not exactly easy to follow the linear route, but it's there. 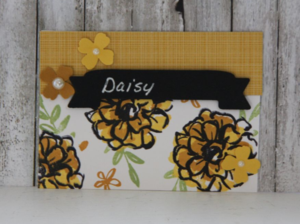 I mean they both have flowers and Daffodil Delight and Basic Black with the framelit from the numbers, but regardless, I'm loving this Sale-a-bration Set What I Love. Here's a secret. It's the first time I used it and I LOVE it. Go figure. It reminds me of zinnias which I adore as well. I found that the key is to stamp the outline first and THEN the two remaining colors. 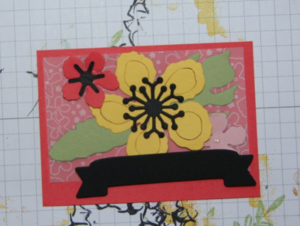 I used Basic Black first and then stamped with Daffodil Delight and Delightful Dijon as the final stamp. Somewhere along the design process, the nametag had vellum along one side and it seemed a little sacrilegious to throw it away, rotated it 90 degrees and added a saying and an adorable card was born. Enjoy….I really need to try whipping up some gluten free brownies for Saturday's Camp. Remember all YOU need to do to get this FABULOUS set for free, is to simply place a $50.00 and it's YOURS! FREE! Too COOL. 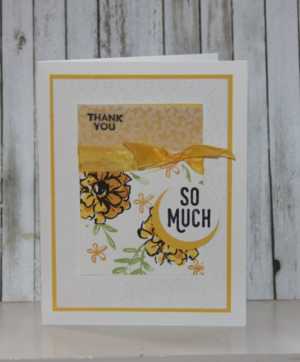 Once you have your minimum of $50, add item #141276 and you can create fabulous cards. I think you will LOVE it..